A serial entrepreneur, Steven is the founder of Buchanan Investment Group, a financial services business. He has been based in Munich, Germany for the past 27 years. 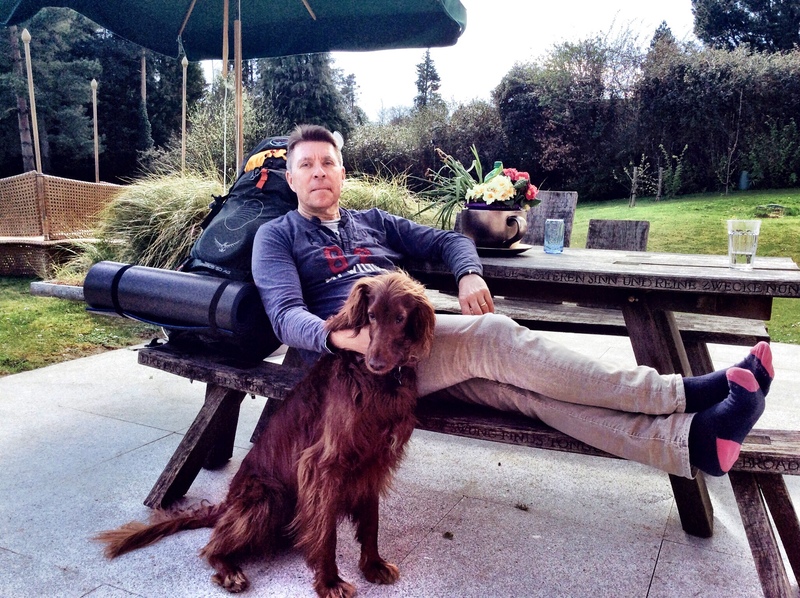 He moved his family to Dublin in February 2015 and resolved shortly after that he would complete a 30-day walk across southern Ireland with his dog. What brought you to Dublin after many years of running successful businesses and ventures in Germany? I have loved living in Germany, but after 27 years there, my wife and I decided recently that we wanted a change. Before moving to Dublin, we knew nobody other than our new landlord, we had almost no friends or connections here, so it was a complete change! You are originally from the UK. What inspired you to pick Dublin over London? I am from the UK, and although I have now spent decades abroad, I recently began feeling homesick for my ‘linguistic home’ – a place where I can speak English. I was not interested in going back to the UK because I believe its political and economic future are uncertain for the moment. The same is true for Germany, unfortunately, as the country becomes more embroiled in the Euro-zone crisis. From a business perspective, Ireland is probably the most attractive place in the EU at the moment. There is palpable sense of optimism growing here, as a country that has recently survived a crisis and is learning from its past. I haven’t regretted moving here for one second! You describe yourself as a bit of an outdoorsman. Tell us a bit more about your history of walking. I have always loved walking, but for a long time I did not do more than 2-3 day trips. This changed 8 years ago when I was going through a challenging time with my business, and had resolved to take 2 months off from work to do the Camino de Santiago in Spain. However, after the financial market crisis hit us hard, I spent the next 3 years repairing and fundamentally redesigning the business and the last two getting back to growth. On difficult days, I would dream about going on a long walk. I promised myself that I would give myself permission to do a proper walking challenge when it was all over. It sounds like walking was a sort of escape for you then? Yes, the thought of walking was sustenance during very trying times. Although it took a total of 5 years before I felt ready to take the necessary time off, I finally set off to do the Thames Trail in England last January. However, serious flooding prevented me from doing that trail, and I completed a 2-week walk through South and North Wales, called Offa’s Dyke, instead. I enjoyed the walk so much that I decided to do it at least once a year going forward. When I moved to Dublin in January, it was clear to me that I wanted to use walking as a means to discover my newfound home. You have chosen to make this a sponsored walk, benefiting the nonprofit organisation Ashoka. Tell us more about this decision. Yes, when I resolved to complete a yearly walk, I also decided that I wanted it to have some positive impact, which is why I will be rallying friends and supporters to sponsor my walk or – even better – to join me in walking it! I chose to support Ashoka because it is an organization that I strongly believe in, and one my wife and I have been supporting for a long time. We were one of the initial small group supporters of the first team in Germany in 2002 and have been fans ever since. Many of the Fellows based in Germany have become close friends. What does Ashoka do? Why drew you to them as an organisation? When I was introduced to Ashoka over twelve years ago, their business model grabbed me immediately, because it remindedme in a number of ways of my business model – that is, looking for specialists at a particular stage of their development and providing them with business intelligence, coaching, access to capital, commercial sense to help them scale – across a diverse range of sectors. I recognized the business model, and I know that it works, I know that doing it that way allows enormous leverage in terms of impact. The process of fostering specialists and encouraging and actively assisting them to be the best they can be is one that can be learned and constantly improved irrespective of the sector. It is a form of venture capital and we understand that..
What really intrigued me in Germany, all those years ago, was that everyone said, ‘We don’t need this, nobody needs a charitable organisation that supports social entrepreneurs, because there are no projects. Our State takes care of everybody.’ And because that was clearly so far from the truth, I decided to put my full backing and support behind an organization that had resolved – and continues to be successful at – proving them wrong! I have received such a warm welcome from the Ashoka team here in Ireland, and I am thrilled to be embarking on this adventure with them. I look forward to learning from them, and helping their network grow.